For gearing, this guide assumes you’re level 90. The other aspects can be used at lower levels. Feel free to share (like, +1, etc.) and add your comments, especially if I missed something or need to add something. Windwalker Monk PvP can be a very satisfying experience. Played properly you’re very hard to take down and you do lots of damage and have lots of control and mobility. Some even say that you’re the toughest of the melee classes. That’s a pretty nice place to be. The talents picked depend a lot on the game you like to play. 2s? 3s? 5s? BGs/RBGs? World PvP? 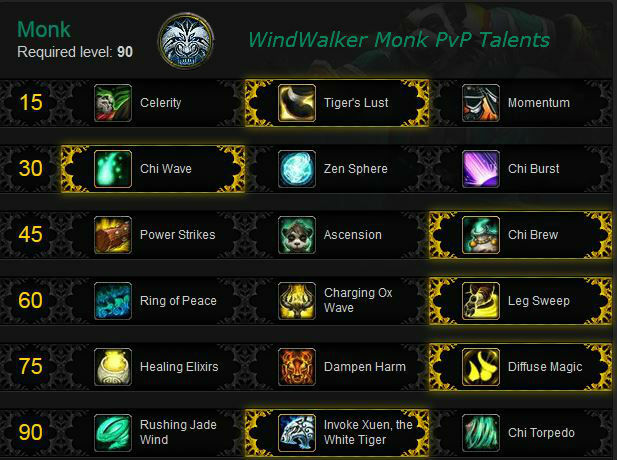 The talents you pick for your WindWalker Monk PvP will be determined by that game and who you have in your team. For example, Diffuse magic is great against casters, not so hot (ok, just about useless) Vs physical damage. This is a good start, below, but keep a stack of Tome of the Clear Mind handy if you want to switch talents for the next game. Our picks are checked: . Talents not described below the image are not interesting. Tiger’s lust for the burst movement and the freedom from snares & roots. It can also be used on your allies and is on a short cooldown. 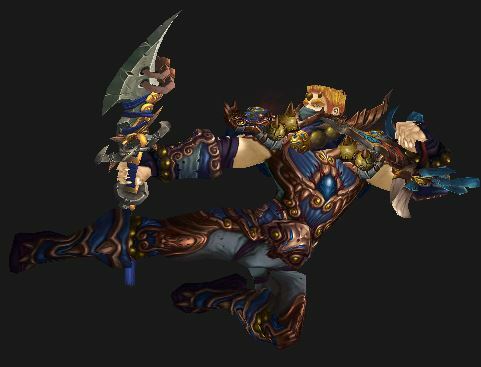 The other two are more PvE or leveling talents. Chi Wave is very nice in 1 vs 1 situations and 2s. In larger groups it will bounce all over the place and can occasionally break CC. Zen Sphere is a decent Heal over Time (HOT) which you can cast on yourself and another. Nice, if you don’t need the more immediate heal of Chi Wave. Chi Burst is also good when casting into stacked groups (certain BGs come to mind), but the cast-time hurts it somewhat. Of course, you are likely jumping into that group, so you won’t have time to waste with casts. Chi Brew – Instantly restores 2 Chi, and generates 2 stacks of Tigereye Brew. More brew stacks = more damage over time. It’s also “on use,” which gives you more control. This is the superior talent for this tier, overall. You will feel a bit energy starved, hence Haste becomes a more important stat. Ascension provides more Chi and Energy for your burst rotations. Chi Brew is generally better overall, but ascension is passive and one less thing to think about. Leg Sweep is nice for your melee range CC. Ring of peace was nerfed in 5.4 and is less generally useful for you than the sweep. It’s good if your team already has a lot of stuns, to avoid “diminishing returns” on the leg sweep stun. Also nice if your ally is beating on that caster over there. Charging Ox Wave is only useful if your team needs a ranged stun. This pick really depends on just who you’re fighting. Healing Elixirs because we like more heals. It makes you that much harder to kill, and it is a passive that occurs when you get low (though you can drink brew or tea to get the benefit.) It’s the pick here just because of the passive and that it works in all situations. Diffuse Magic for a major reduction in incoming magic damage (and it also clears effects) every 90 seconds, plus it has a chance to reflect that damage. Not so hot Vs physical damage (eg: that Warrior pounding on you.) Consider Dampen Harm if you’re facing non-magical damage. Dampen Harm is a fine talent for when you can anticipate incoming damage, though it’s probably a better PvE talent. Also usable while stunned, which is rather nice in PvP. Invoke Xuen, for extra single target damage. 45 seconds of extra damage every 3 min isn’t bad. Rushing Jade Wind is great for jumping into BG groups and decent for single targets, though not up to Xuen. Glyph of Touch of Karma extends the range to 20 yards. This makes the macro, below, much more useful. Glyph of Paralysis helps your Paralysis ability to stick to the enemy. Glyph of Fists of Fury gives you a much higher parry chance while using your opponent’s face as a speed bag. Glyph of Spinning Crane Kick occasionally useful, if you need more movement while spinning. Glyph of Touch of Death removes the Chi cost, but increases the cooldown. Your 4 piece PvP set bonus allows T of D to be used on players when they hit 10% health. If you don’t have that set bonus then this glyph has no value in PvP. Glyph of Fortuitous Spheres – Causes an extra healing sphere to appear when you’re getting low. Glyph of Water Roll allows rolling over water, which has its uses. Glyph of Blackout Kick provides more damage, but less healing. Glyph of Spirit Roll allows you to get back to your body a bit faster. Glyph of Flying Serpent Kick only works if your targeting is exact. What’s the WindWalker Stat Priority? Hit – while anything over 3% does you no good, it’s better to be a bit over than a bit under, since missing is bad. Lining up that mighty strike and then missing does little for your chances of winning. Expertise goes against your opponent’s chance to Dodge after you “hit” him. 3% eliminated the basic dodge chance. Some people recommend higher amounts when fighting dodgy classes, such as Rogues. You might not notice any difference with 3 or 4 more points of Expertise..
Agility improves everything you do. Haste If Rushing Jade Wind is the preferred talent then Haste might well have a lot more value than otherwise. 10-15% Haste should do you very well, after that start looking to get more Crit. You will be taking Chi Brew as a talent and the added Haste will help with Energy. Crit, while random, allows more consistent damage than your Mastery, especially when you don’t have brew stacks available. Mastery will let you accumulate Tigereye Brew stacks more quickly. You will get to blow those stacks more often, since they accumulate faster, but your damage at other times will be a bit less. PvP Power isn’t worth stacking; the stuff on your gear with be enough. Resilience gets a nice bonus if you have both PvP trinkets, which brings the total to 80%. You will want to gear for offense, instead of more defense. Get the ReforgeLite addon, which will make reforging easy. Here’s a video on how to use it. Follow the stat priorities, making sure you have your Hit and Exp. Check your Haste number. If it’s around 12-13% then you’re probably good. Get a bit more if you feel that your energy regen isn’t so hot. Next, get as much crit as possible. Alliance can get their level 18+ stuff here, and Horde here. From 70+ you can get legacy arena gear form these vendors. PvP Vs PvE gear? See this post for a longer discussion. Basically, in a PvP scenario (BGs, Arena) PvP gear is superior since high level PvE gear is greatly downrated. PvP gear has a lot of PvP Power which makes up for PvE gear maybe being a few item levels higher. In world ganking (er…. World PvP) there is no downrating of gear. If your PvE set is 40 ievels higher than your PvP set, then use it. As of this writing, in season 15, the PvE gear is downrated to 524, which is inferior to the 522 Honor gear due to that PvP power on the latter. Are you freshly level 90? If you have the gold then buy the Crafted Malevolent leather set. That’s good enough to get you started in the BGs, though you’ll want to get better gear soon. In the cases where there are two items available for a slot, eg, wrist, then get the piece with Crit. If you spend a couple of hours wandering about the Timeless Isle you should be able to get the full (or close to it,) 496 PvE gear from the various boxes and such. It’s not optimal for PvP, but it’s way better than the stuff you were leveling with and it’s at least as good as the crafted set. Why the honor gear? Because it makes the RBGs and Areas, while earning your Conquest points, less painful. In season 15 the honor gear is 522, which is way better than the 476 crafted gear or the 496 Timeless gear. You can, if you want, skip the honor gear and go straight to grinding the conquest gear, it’ll just be a bit more painful at first. You might want to consider at least grinding for the honor weapons. Which Honor pieces are best to get first? Any items that really need upgrading (e.g., green questing items.) Take care of them. These will be your biggest gains. 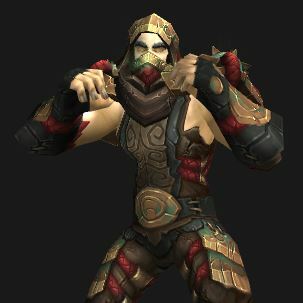 For the rest of the gear, the Tyrannical Gladiator’s Ironskin Gloves are a good first overall choice for the ability to break free from snares and they’re part of the set. Otherwise, get the bigger pieces. They have better stats. Also consider working for the 4 piece set for the PvP stats and their 4 piece set bonus, which is something of an “execute” ability. (see it here: Tyrannical Gladiator’s Ironskin Tunic) You need any four of: gloves, helm, legs, tunic, shoulders. Upgrade the weakest item first. 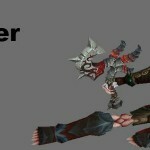 Get the gloves (Prideful Gladiator’s Ironskin Gloves,) if you don’t already have them from the Tyrannical set. The freedom from snares is rather nice. Get the bigger pieces and get that set bonus. This set is just a cosmetic change and adds no stats or abilities. You need to earn 27k Conquest Points in the current season in order to buy the pieces. Matching socket colors is generally recommended. If you need Expertise then you should get it through the gems, rather than the enchants, since you get more out of each gem. PvP Power gems have the same stat value as Agility (ie, 160 points) so skip the PvP power gems. Resilience is up to you, but it’s pretty high in 5.4.7 (77%,) and higher with the trinket pair (80%,) so isn’t worth gemming for. Meta: Agile Primal Diamond till you get to the Tyrannical Primal Diamond, which has more defense and nice PvP Power. Any survivability is good. If you’re playing with a decent healer then it’s less important than otherwise, but the PvP Power is a nice plus. Another possibility is the Powerful Primal Diamond, which adds a bit of survivability when you’re stunned. With only a couple of exceptions the PvP enchants are the same as the PvE enchants. 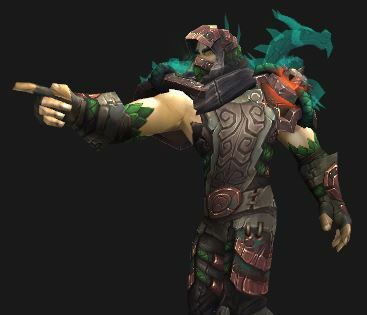 So if you’re PvPing in your PvE gear then you don’t have to change anything. Chest: resilience if you need a bit more, otherwise stats if you already have decent heals/survivability. Enchant Chest – Glorious Stats: +80 to all stats. Enchant Chest: Resilience: +200 Res. Weapons: (dual wield in order to get the two enchants:) Enchant Weapon – Dancing Steel for the main hand and Weapon Chain on the off-hand. Disarm normally leaves you vulnerable for 8 seconds; Weapon Chain reduces that to 4 seconds, which will help in tight situations. If you’re fighting classes w/o disarms, then 2x Dancing Steel is nice. Leveling up Blacksmithing and Engineering is gonna be costly. If you’re not that rich then you should look at Tycoon to help with your gold flow. Engineering for the Synapse Springs glove enchant cooldown, plus useful toys like parachutes & gliders & movement boosts. Blacksmithing for the flexibility. Provides two extra gem sockets. Useful, if Resilience ever becomes the top stat again or Haste/Crit become a lot more valuable at some point. Jewelcrafting for better gems; slot two of them. You will get 320 extra Ag. Enchanting for Ag on rings. You will get 320 extra Ag. Leatherworking for the Ag bracer enchant. You will get 320 extra Ag. Inscription for the Ag shoulder enchant. You will get 320 extra Ag. Alchemy adds about 30% (320 Ag) to your main flask and doubles the duration. Potions are not usable in Arena, though. 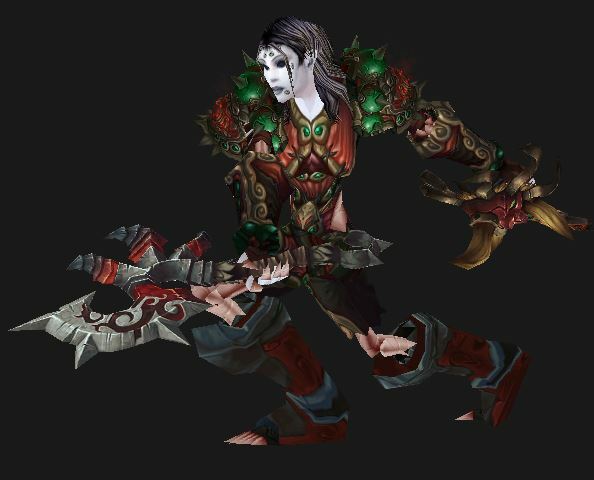 Herbalism for the Haste cooldown and to earn more gold. These two abilities should be immediately applied to any target, including when you switch to a new one. They will greatly increase your burst capability. Rising Sun Kick which causes you to do 20% more damage to the target and any other targets nearby. It also reduces the healing received by the target. Also be aware of when/if these get dispelled, so you can re-apply them. Legacy of the White Tiger adds 5% to your crit, and also to that of the entire party. Legacy of the Emperor adds 5% to Ag, Int, and Str to all party members. Tigereye Brew buffs your damage. Every 3 Chi you use gains a stack of brew. Try to use it only when you have 10 stacks and you can combine it with your “on use” trinket. It takes a while for these to build up, so you will want to use your “on use” trinket early. By the time the brews stack up, your trinket will be ready again. Energizing Brew restores energy, use it only when you’re really low. Energy and Chi – make sure you have enough before popping cooldowns. Storm, Earth, and Fire, while not a cooldown, has its uses when you need to spread the Mortal Strike effect. Expel Harm is useful when a heal is needed. Jab – this will be your default Chi builder and is also used for dumping energy. DR = Diminishing Returns. For example, stun #2 will be half its normal duration and #3 will be half of the half. Use Rising Sun Kick on cooldown, in addition to the damage it applies a “Mortal Strike” effect, reducing enemy healing. Tiger’s Palm costs 1 Chi, reduces the enemy armor. Keep this up. Blow the procs as they appear. Fists of Fury – Try to make sure you won’t cap your energy while doing F of F or overlap other cooldowns. Try to do F of F when at least a few seconds remain on the above CDs. Also be aware of Stun DRs. Alternate Jab and Blackout Kick while cooldowns are down. Paralysis puts one target “to sleep” for a few seconds. Disable snares your target and will root him if he’s already snared. Spear Hand interrupts casting and can briefly silence. Fists of Fury damages targets in front of you and stuns them. Crackling Jade Lightning will knock an opponent back. Touch of Death, if you have the 4 piece PvP gear set bonus, will insta-kill your opponent if he drops under 10% health. The Glyph of Touch of Death removes the Chi cost and increases the cooldown. That might be very useful if you get the opportunity, but the Chi isn’t there. Roll – your main ability to close and run away. Flying Serpent Kick – a great escape or long range gap closer. Tiger’s Lust – breaks roots and snares and speeds you up. Great for escaping Novas and such. Transcendence: Transfer – set it up behind a pillar or otherwise out of sight, fight a bit, port back. Nice escape when things get tight. Dropping some Healing Spheres on your return portal can really help out. Darkwater Potion for some extra movement wherever potions are allowed. Chi Wave – bounces between you and the target. Expel Harm – also damages the enemy for a portion of the amount healed. Healing Elixirs activates when an attack brings you under 35%. Healing Sphere – drop these and walk through them for a nice heal. Detox – not a heal (unless glyphed,) but it clears off certain effects, which is very nice. Fortifying Brew – 20% more health, 20% less damage taken, lasts 20 seconds. Touch of Karma reflects all damage back to the attacker for a few seconds. Monks can do a lot of self-healing. Keep your heals sorted, run and kite, and you will be very hard to take down. When healing cooldowns aren’t immediately available you can kite the enemy, or run, and give yourself some time. Porting back with Transfer can let you use the Healing Spheres you left there. Make sure you do enough attacking to keep making those Tigereye Brew stacks. Place more Healing Spheres in strategic places when you get a chance. Switching targets, via Rolling or whatever, is a good way to escape some pressure and let your heals come back. Keep in mind that you do have to maintain some pressure to keep those Tigereye Brew stacks coming, otherwise your burst will be less than it could be. If you have a Skill-capped membership you can see a video of a WW Monk going 1 Vs 2 against a DK and a Druid. 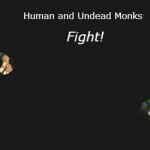 The Monk wins. Get Better, Get Skill-Capped Now. Uses your Tigereye Brew, trinket, and Engineering cooldowns. Slot 14 is the 2nd trinket slot, and 10 is for your gloves. There are a variety of macros you can use for your team members, if you’re so inclined. Detox, Ring of Peace, and Tiger’s Lust are three such examples. What these do is activate the specific abilities on the targeted team member. These are great if you run with a regular team, such as Arena teams, not so much if you’re just soloing or doing random BGs and such. Here’s an example, just change ‘NameOfPlayer’ to your buddy’s name and the ability as appropriate. Is your “focus” target getting a bit uppity? You can use several macros to help out. This way you don’t have to drop your current target in order to hassle your focus target. This is nice if your focus target is in melee range. For example, you have a Mage targeted and then the melee attacks. The Mage opens up on you and you let the melee take the damage. Occasionally useful. Hand of Protection will get in the way of your Touch of Karma, hence the ‘cancelaura.’ H of P also does not help Vs magical damage. The glyph extends Touch’s range to 20 yards, making it much more useful. Use a Spear Hand Strike to interrupt your opponent. Use the ‘shift’ key when targeting your focus instead. Get more macros, pro level keybinds, and improve your game with the Impulse addon. 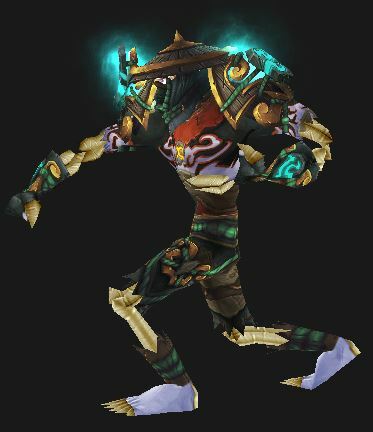 Worgen and Goblins are the only races which cannot become Monks. The most that any particular race will provide in term of DPS is maybe 1% overall, not enough to care a lot about. Still, if you want every bit of burning power for your flying kicks here’s how they stack up.Only the points relevant to PvP are shown here. Note that most of the racials will change in Warlords of Draenor. Melee range stun will be useful on trash mobs and occasional bosses. Escape ability allows you to replace the PvP escape trinket with a DPS trinket. Mace or Sword expertise will help you get to that 3% cap for easier reforging. Stone Form washes away some effects and reduces damage by 10%, which has its uses. 2% Dodge is a nice perk, you will take just that much less damage. Shadowmeld is nice as a cheap Vanish or to lurk in wait as an Ambush. +1% Hit is nice and makes end-game gearing a bit easier and you don’t have to have any particular item equipped to get it. The self-heal is always useful, even with those you already have. Resistance to stun effects is definitely useful. Increased damage Vs beasts is nice for PvE or leveling, but is of no use in PvP. .
Additional Stam doesn’t scale well at very high levels, but is still equal to about three stam gems. Arcane Torrent will silence casters, which has its uses.